(Newser) – China is flexing its military muscles, according to a Pentagon report that gets right to the troubling point: "Over the last three years, the PLA [People's Liberation Army] has rapidly expanded its overwater bomber operating areas, gaining experience in critical maritime regions and likely training for strikes against US and allied targets." While the Pentagon doesn't say exactly why China is undertaking these operations, per the BBC, the report posits that Beijing may try to demonstrate its ability to strike centers of American operations in the Pacific, including Guam. Beijing is also "likely preparing for a contingency to unify Taiwan with China by force," with any American intervention to be warded off with a "high-intensity, limited war of short duration." Honestly, why would they attack their main benefactor. I mean really, if they attacked us, we wouldn't be around to buy the crap they make there. I guess it could help them recover their vastly damaged ecology. I mean they have a hundred large lakes located near places like Shenzen that cannot support life because of all of the circuit board toxic waste. And what about their direct investments like turnpikes, companies, buildings, land, and such? And they hold a ton of US bonds that could feasibly turn into outhouse wallpaper if they attacked us. 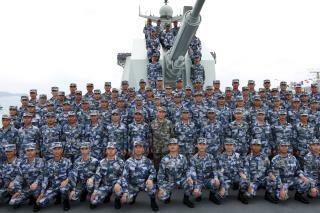 China's military spending ballooned to $190 billion .. Where would they get that amount of Money??? Oh YEA!!! We gave it to them.. in an Unfair Trade Balance..
What happened to the increased DOW over improving approach? Why don't these Fake Newsers get their cockamamied crap reports more believable. Actually China isn't or ever has been anything remotely close to being a threat to world peace as either the U.S., or Russia, Israel, UK.